This page depicts life at the Fifth Street (Business Route 66) home of my paternal Great Grandmother Parlee Henson, Grandmother Ruth Henson, and Father Darold Henson (late 1910s through the early 1980s) in Lincoln, Illinois. Click on the annotated, bird's-eye-view map below for a larger version. Ruth Henson and her mother, Parlee Webb McCoy Henson, bought a house on Fifth Street in the late 1910s soon after they came to Lincoln from southern Illinois to find work at the Lincoln State School & Colony (for my webpage on the history of that institution and my Grandmother Ruth Henson's 40+ years of employment there, access http://findinglincolnillinois.com/lssandc.html). 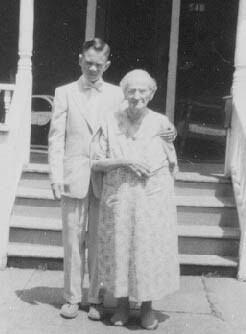 Great Grandmother Parlee and Grandmother Ruth had the same last name because Grandmother Ruth had married a grandson of her stepfather, John F. "Blackberry" Henson, a southern Illinois farmer and itinerant preacher in the Re-organized Church of Latter Day Saints (now the Community of Christ). Parlee was apparently named for Parley P. Pratt, an early apostle of the Church of Jesus Christ of Latter-Day Saints, who helped convert many pioneers in southern Illinois in the 1830s. 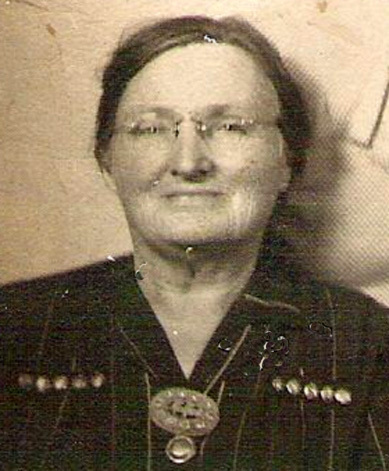 Great Grandmother Parlee, who had attended Southern Illinois University in Carbondale and taught school, was the first person who told me I could and should "go to college." 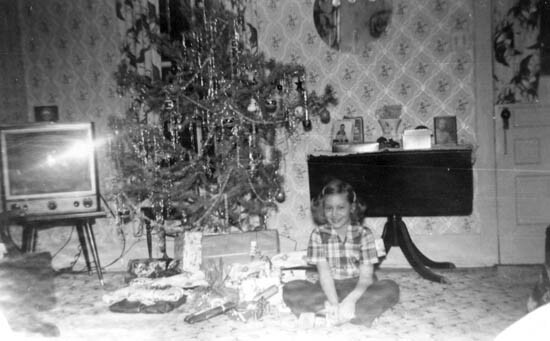 My father, Edward Darold Henson, was born on September 17, 1918, in this house in the front bedroom (behind the window at the left in the photo) during the Spanish flu outbreak that killed William Maxwell's mother just two days after she gave birth to her third son (William's younger brother), Blinn, on January 1, 1919. My father and Blinn became acquainted at Lincoln Community High School. Darold was Class of 1936. Blinn, Class of 1937. In Ancestors, William Maxwell says his paper route in 1921 included the inhabitants of the Postville Courthouse, plus twelve other customers (p. 135). 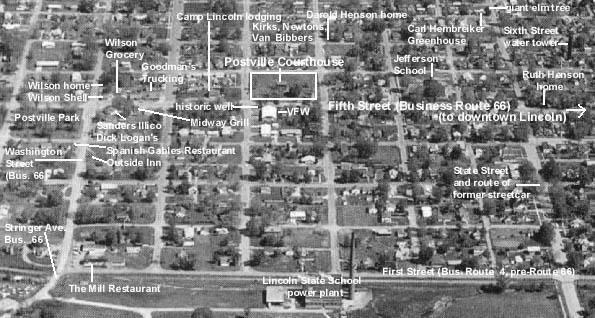 Most likely those customers were other residents on Fifth Street, which would have included the Hensons, since they were avid readers of the Courier and lived just four blocks from the Postville Courthouse toward town. My Great Grandmother Parlee Webb Henson, born in 1867, was the oldest of 10 children of Allen Nimrod and Clementine (Simmons) Webb. (Jackie Webb has kindly included the names of these 10 children at Rootsweb, whose address is given below under Sources Cited.) Parlee came from the log-cabin days of self-sufficiency and embraced frontier evangelism. Her father was a volunteer for the Union in the Civil War, which he survived. For his military service, he was given land (@1,000 acres) to homestead in southern Illinois (Johnson County, near Tunnel Hill). He had in turn divided this land among his children, but farming was too hard to hold all of the family there. The house was a one-story structure with large kitchen, pantry, dining room, living room, two bedrooms, and a screened-in back porch with small bed for pleasant sleeping on hot summer nights. The fanciest part of the house was the handiwork on the porch's banisters, columns, and trim. Undated, probably taken at Tunnel Hill. 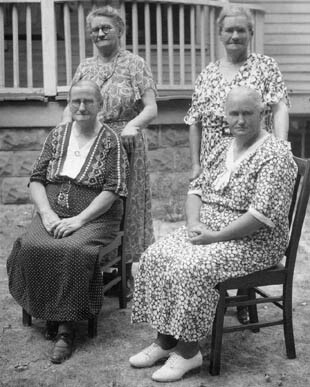 Left front is Parlee, front right Sarah Armilda ("Mill"); back left is Laura; back right, unidentified--probably Luranis ("Rena" or "Rana") or Mary Magdaline "Maggie." Allen Nimrod Webb volunteered for the Union Army in 1862, being assigned to the 31st Regiment Volunteer Infantry, 60th Regiment, Company K (P.T. Chapman, A History of Johnson County, Illinois, pp. 181-183). According to this source, "The 60th was organized at Anna, February 17, 1862, engaged in the Sieges of Corinth and Nashville, battles of Murfreesboro, Chattanooga, Buzzard Roost, Kennesaw Mountain, Peachtree Creek, and many smaller battles and skirmishes. They participated in the Grand Review at Washington, D.C. The 120th contained more men than any other regiment from this county and was organized by Colonel John G. Hardy of Vienna. It was composed of companies A, B, C, E, G, I, and K. They went into camp at Vienna August 13, 1862 and were mustered into service the following October. This company lost many men during the fall and winter with Small Pox, Measles, and Pneumonia. Their campaign was waged mainly in Tennessee and Mississippi. They did guard duty in many sections of the south., also taking part in many minor battles and skirmishes. Many of their men served long terms in rebel prisons. There [sic] principal battle was Guntown, Miss." (p. 177). A summary of several of these battles can be found at the link below to the "60th Illinois Infantry Regiment." Allen Nimrod Webb survived the full length of the Civil War and was mustered out Feb. 16, 1865. 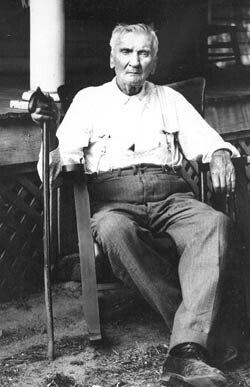 According to family oral history, Allen Nimrod Webb was wounded at the battle of Buzzard Roost, and he carried the slug in his leg for many years. One day while he was plowing, the slug worked its way out and fell on the ground. He kept the slug in a mantle clock for many years, but I do not know what became of it. 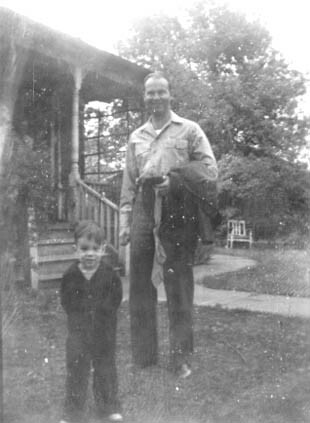 My father, Darold, remembers his Grandfather Webb visiting his family on Fifth Street, calling Darold "Darrell" and giving him "coppers." A.N. Webb died March 15, 1931, at Tunnel Hill, Johnson County, Illinois, and is buried in the Webb Cemetery between Goreville and Tunnel Hill near the Community of Christ Church (formerly the Reorganized Church of Latter Day Saints). Parlee had married John F. "Blackberry" Henson after the death of her second husband, Mitchell Webb, from typhoid fever in 1905. The 1912 photo below shows Parlee standing piously next to her husband, John F. Henson, both prominently in the center of a gathering of the Saints. She looks vigorous and has a Bible cradled in her left arm, her right arm positioned behind her back. I have also circled Parlee's daughter, Ruth Ann Webb Henson, who was 13 at that time. Soon after this photo was taken, Reverend Henson died of blood poisoning from a splinter infection. Great Grandmother's house rules reflected her Christian convictions. Darold told me that when his mother's older brother, Dad's Uncle Ruel, lived with them for a while, he had hidden a pistol in the house. 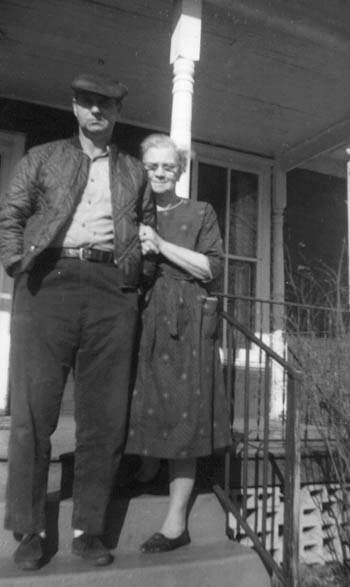 He was not an outlaw, but he knew his mother disapproved of firearms. My great grandmother found the pistol and took it to the backyard where she smashed it with an axe. He chain smoked -- three packs of Clown cigarettes a day -- and continuously read paperback westerns. I have one of his Zane Grey's. His discarded cigarette butts lay on the ground in front of the porch like dropping petals from the white flowering shrubs that grew there and long remained a cruel reminder of his death from lung cancer 1951. His funeral near Goreville, Illinois, introduced me to the southern Illinois rural heritage of my Henson and Webb ancestors. Fortunately, she expressed her religious views to me only moderately. She often softly urged me never to smoke or drink. How could I say no to someone who spent many hours quietly sitting in her rocking chair reading the Bible while occasionally eating whole green peppers and onions like apples? My penance for that betrayal is endless. To this day, I occasionally sit in her old rocking chair and contemplate how to reduce that burden. 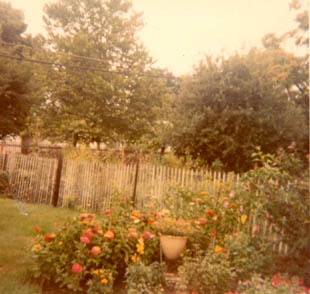 The backyard of their Fifth Street home was the main resource of her self sufficiency. She raised chickens there until the early 1950s, obtaining chicks from Sieb's every winter and nurturing them in her basement so they could be ready to move outside in the spring. I remember holding the tender chicks in the basement. In the back yard, Granny showed me how to pull a certain kind of weed ("chick weed?") from the grass and feed it to the chickens. She said it was like ice cream to them. Sometimes I was allowed into the (smelly) chicken coops to gather eggs. I also recall Granny ringing chicken's necks by the back porch. Those headless victims ran wildly in circles until they collapsed, and then she hung them on a special clothesline-like rope to pluck them. 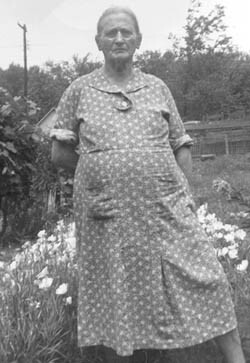 She continued raising vegetables and flowers until her death in 1958. Everything in the backyard grew abundantly. I have spaded gardens in many places, but the Hensons' ground was the loosest, richest I have ever worked as a result of the coal stove cinders worked into the ground there. The soil was rich from the organic fertilizer generated by raising countless chickens and working the manure into the garden soil. Granny knew her gardening. From her backyard came rhubarb, red and white radishes, carrots, strawberries, lettuce, green beans, wax beans, tomatoes, potatoes, grapes, cherries, peaches, and apples. She also knew her cooking, baking almost daily: often fruit pies. She baked or fried chicken at least once a week. She introduced me to rhubarb pie and to the hearty dish of long-simmered wax beans or green beans and potatoes flavored with generous amounts of bacon grease. Like others of her background, she canned tomatoes and green beans until advanced age and summer heat and humidity made her quit. Shrubs, flowers, and ferns surrounded their house. 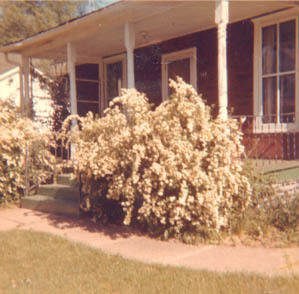 The front porch banisters and lattice work were always covered with clematis and honeysuckle. Ferns and lily-of-the valley grew on the west side of the house, shaded by large maple trees and a pear tree in the neighbor's yard. The sunny east side of the house was colorful with yellow spring daffodils; purple iris; red, orange, and purple summer zinnias; and yellow and white fall mums. Parlee transplanted pink and white peonies from the Webb family cemetery in the Illinois Ozarks of Johnson County. Every year her backyard near the house had large areas devoted to marigolds and giant zinnias, which seemed to grow up to her shoulders, and the shade behind the pantry yielded prolific nasturtiums with bright flowers of many colors. 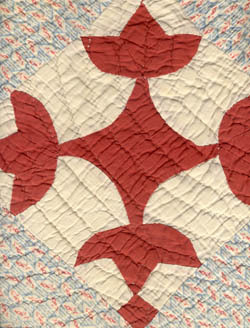 Granny Henson created the quilt with the red-tulip pattern, and Grandmother Ruth crafted the one with the butterfly pattern. A little boy lived with his parents in a house by the sea. His parents always cautioned him against wandering off. One bright, sunny morning the boy pushed his dad's beached boat into the water and climbed in. He intended to take a little ride, being careful not to row out of sight of the shore. His rowing made him tired, and he lay down in the bottom of the boat, the warm sun helping to put him to sleep. When he awoke, the sun was going down, and he could no longer see the shore. Night came on, and a storm violently tossed the boat for hours. Finally, it passed, and the boy saw first light, but he was still lost and terrified. He again lay down in the boat, looking up into the deep blue sky and white drifting clouds. After a while, he saw a butterfly high above. He sat up and noticed the butterfly was circling the boat. It finally landed on the back of his hand, then flew away. The boy watched as it flew away out of sight, but soon he could barely see it again. It would disappear, then reappear. 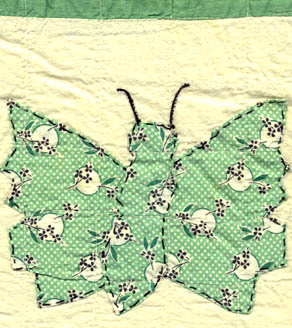 He began to row toward the butterfly for what seemed like endless hours. He began to smell the fragrance of trees on the breeze and knew land was in that direction, so he kept rowing. As he finally reached shore, the butterfly had completely disappeared, but he could see people running up and down the beach, waving their arms and yelling at him. After he reached shore, he found his parents, who took him in their arms, as he promised never to go exploring again. The allegory is apparent -- although Grandmother never moralized or tried to interpret "the theme," as we English teacher types say --, and the story was a bit charming: of course, we all know that it is human nature -- especially in kids, but also can be true of adults -- to vacillate between wanting to stick close to home -- hold to the familiar for security --, but also wanting to explore. All our lives, we follow the pattern of venturing forth, then pulling back. I suppose my life meagerly reflects these profundities. I've enjoyed exploring, but safely limiting my boating to lakes and streams without fear of getting lost (although my kids may disagree as they witnessed my map reading on the water many times). I've also enjoyed the indirect exploration of reading and writing -- without heading down the Mississippi as Huck Finn did on a cobbled-together raft (and he got lost more than once on the adventure) or crossing the south Pacific on a raft with sails as Thor Heyerdahl reported in Kon-Tiki (and he was lost the whole time). Another aspect of Parlee and Ruth Henson's rural background was their fondness for country music. I remember that Ruth sometimes strummed her guitar, and all of us listened to the WLS Barn Dance on Saturday nights in the 1940s and early 1950s. 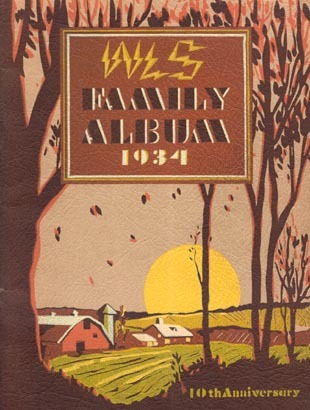 Parlee and Ruth bought the WLS Family Album, and I have its editions from 1933 to 1953 (except for 1946). On WLS I heard such artists as Gene Autry, Red Foley, Lulu Belle and Scotty, and the Prairie Ramblers and Patsy Montana. That formative experience probably accounted for my attraction to the folk music revival of the 1960s, my discovery of Joan Baez and Doc Watson, and my subsequent interest in the roots of country music. How else can I explain my acquisition of tapes of such legends as Bob Wills, Ernest Tubb, Lefty Frizzell, Jim Reeves, Eddie Arnold, and the young Merle Haggard? 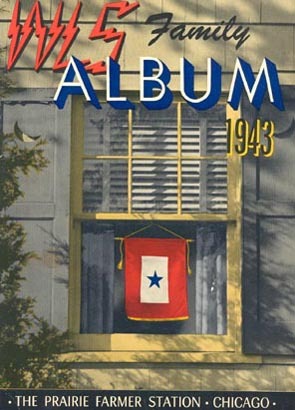 A note concerning the blue star flag seen in 9.14: "During WW II, a flag with a blue star was hung (usually in the parlor window) to signal that a family member was on active duty in the armed forces of the United States of America. In the event that the service member died, a gold star was pasted over the blue star. This gave rise to terms such as Gold Star Moms, Gold Star Wives, Blue Star Moms and Blue Star Wives and organizations by those names." Darold Henson served in the Army during WW II, was wounded in the Battle of the Bulge, and received the Purple Heart. 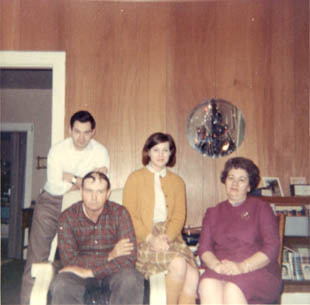 The colorized photo above had a gilt, oval frame and curved glass cover; it hung in the "front room" of Ruth Henson's home from approximately 1945 to 1985. I have often wondered about the culture clash that Parlee must have experienced as she tried to retain her rural southern Illinois lifestyle in a central Illinois town during times of great technological advancement. Sitting on her front porch watching the world rushing by on Business Route 66 must have increased her awareness of the many changes during her lifetime. She was uncomfortable riding in a car that traveled more than 40 mph, and she was terrified even at the idea of flying in a plane. I did inherit both her fear of excessive highway speeds -- only my threshold is somewhat higher than 40 mph, but less than the apparent average Interstate rate of 85 mph --; and I have never flown and do not plan to. As a kid, Route 66 taught me that the rushing world could be threatening to what I held dear. When I was five, my first cat, Muff, was laid to rest at the back of her garden at the edge of the hollyhocks when it became a victim of the traffic on Business Route 66 in front of their house. Grandmother Ruth showed me where she had buried him. I was horrified to find one of his paws visible from the side of his shallow grave. 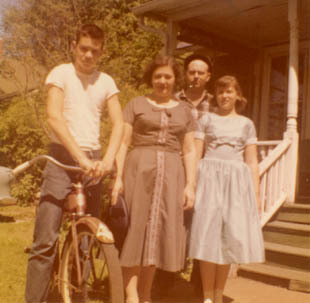 I spent some of the most wonderful times sitting on the front porch steps of the Hensons' house on Fifth Street. Often I sat there drinking lemonade after mowing the yard. 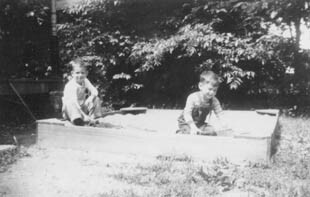 In the first few years, their mower was the old-fashioned push kind with a reel blades. Their yard was about 75' by 150' with much of the backyard devoted to garden, so the job was reasonable for a nine- or ten-year-old (kids in those days were in good physical shape). 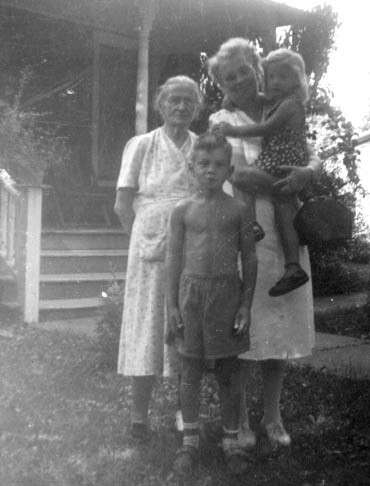 I recall Grandmother Ruth continually warning me about mowing at the edge of busy Fifth Street. When I mowed the front lawn near the street, I walked at the edge of the street so I could face oncoming traffic. Cars did not usually bother me, but trucks made me step out of the road onto the lawn. I was determined to avoid Muff's fate -- to borrow Maxwell's expression, "stay out of the cemetery." 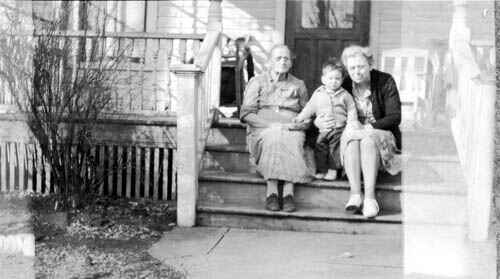 On the front porch steps, Grandmother Ruth, my sister, Linda, and I played Indian school and literally watched the world go by. I saw an endless parade of cars and trucks on the Mother Road. It was great fun to try to name makes, models, and years of cars as they passed both ways. Squirrels leapt across the street from the high branches of elms and maples, only occasionally falling to the pavement to be flattened by trucks rumbling through town. And in the evening as darkness fell, lightning bugs ignited the lawn with their sparkling fireworks. My Great Grandmother Parlee had attended Southern Illinois University at Carbondale and had taught in rural southern Illinois schools. Maybe that's the reason they let me play to my heart's content on their old manual typewriter and always found more paper for me to cover with neat-lettered nonsense. Even then I knew I was tampering with something important and that not all adults would allow it. Granny and Grandmother Ruth valued education and were largely responsible for convincing me that I should go to college. Because I did, I developed a life-long interest in learning -- a long and winding road leading to this Web site publication. If this photo were in color, it would show I wore blue suede shoes -- the Elvis Effect already. Ruth Henson worked at the Lincoln State School & Colony for more than 40 years. For an account of her pioneering work there, including photos, see "A Career of Untiring Service to Suffering Humanity" in this Web site at chapter 27. Lincoln Developmental Center (Lincoln State School in the Route 66 era). As the world passed by on Fifth Street (Business Route 66), the Hensons experienced their version of the American dream over a period of more than sixty years (late 1910s to the early 1980s). Above I mention that my cat, Muff, perished on Business Route 66 (Fifth Street). My dad's four-legged friend, Boots, escaped that fate. 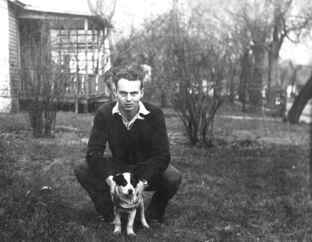 Boots was truly a creature of his time--something rarely seen today-- the neighborhood dog. Boots' owners were the Bruners, who lived at 6th and State Streets--on the other side of the block where Darold and his life-long friend, Duane Huffman, lived. Boots often spent the day at Duane's, but often roamed the neighborhood. Various Fifth Street neighbors played with Boots and fed him. In his wanderings, Boots never crossed Fifth Street and thus proved to be smarter than Muff, the cat. In the photo, Fifth Street is barely noticeable in the background at the right. 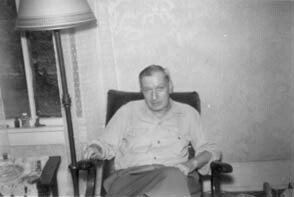 The date is about 1944-45, the occasion unknown, but most likely Darold was returning home from being wounded at the Battle of the Bulge. He was probably coming rather than going because he has removed his necktie. I have two memories of this period, when I was about three. In one scene, it was late at night, and a cab stopped in front of the house (the cab driver had a cast on one foot), and Dad got out and came into the house for a happy homecoming. 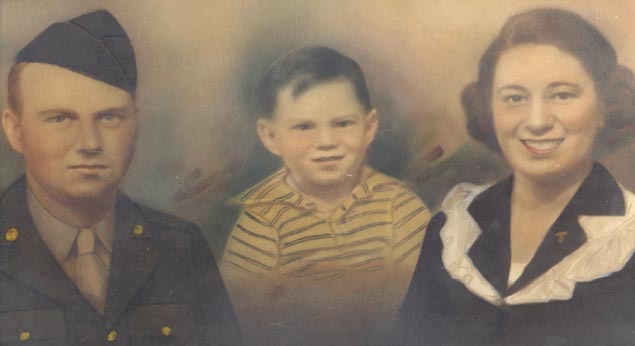 In the other memory, Grandmother Ruth and I rode a train to Tomah, Wisconsin, where Dad was stationed during his recuperation before being discharged. The train ride was a lot of fun. I remember the excitement of wandering up and down the aisles and repeatedly pulling little paper cups loose from a dispenser and pouring myself a lot of drinks from a water cooler. 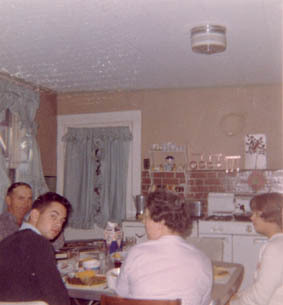 I also recall eating with Dad and Mom on the Army base in a large mess hall. This photo was probably taken by Jane Henson. 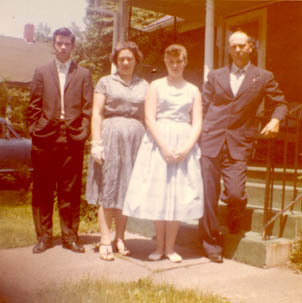 The first and last photos on this page show the front porch about forty years apart. Time is never kind to outdoor woodwork. The above photo shows that the wooden steps, banister, and railing are gone; and only the main support posts remained in the early 2000s. Also remaining are the family love and devotion. Chapman, P.T. A History of Johnson County, Illinois. Herrin, IL: The Press of the Herrin News, 1925. Henson, Alma Lee Rockett "Bud." The Henson Family Line. Privately published, no place or date of publication. Henson, D. Leigh, Lincoln Developmental Center, Named the Lincoln State School (& Colony) in the Route 66 Era, http://findinglincolnillinois.com/lssandc.html. Henson, D. Leigh Henson, Webb/Henson Roots in the IL Ozarks, including photos of the Webb Cemetery, Johnson County, Illinois, https://photos.google.com/share/AF1QipNvL5IQ5rlRlJtP26zt1HXu7G3f6mUFD0S45uDTT8BgmUfp-27zCH-8tLykk22chQ?key=ZjhGSUJDTE81TVVyZFNWQ0NGRkdZT1pNRERWRDZn. Pratt, Parley P., biography, https://en.wikipedia.org/wiki/Parley_P._Pratt. Webb, Jackie. Johnson County, Illinois, Webb family history at http://johnson.illinoisgenweb.org/biographies/biowebbmitchell1925.htm. Webb, Parlee Webb McCoy Henson at FindaGrave, https://www.findagrave.com/cgi-bin/fg.cgi?page=gr&GSfn=Parlee&GSiman=1&GScid=108770&GRid=44978880&. 60th Illinois Infantry Regiment at https://civilwar.illinoisgenweb.org/reg_html/060_reg.html.